Patriot America Insurance provides comprehensive medical coverage for travel to the USA for individuals and families who live outside the USA. After the deductible is satisfied by the insured person, this insurance plan pays 100% within the PPO network, up to the policy maximum. The plan provides travel medical protection including out-patient treatment, in-patient treatment, emergency services, emergency medical evacuation, and more. Patriot America Insurance covers trips between 5 days to 12 months at a time. The plan can be renewed for a maximum of two years. 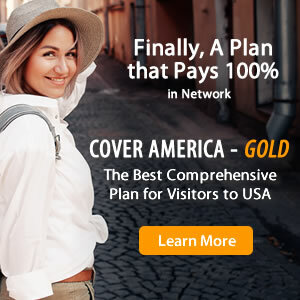 Partiot America Insurance is best suited for international travelers visiting the US or outside their home country. This policy also meets the requirements for Schengen Visa Travel Insurance and Europe Travel Insurance. A visa letter for visa purpose can be provided. How to Buy Patriot America Insurance? I bought it for my dad when he visited me last year. I used it once for outpatient treatment at providence clinic. They didn't have this insurance in their list but they accepted it as the underwriter is based in USA. As my deductible was zero I didn't have to pay anything from my pocket, few months later the claim was processed without any issues. I would recommend it. Easy to buy, many options ! We are happy to hear about your positive experience with IMG and Patriot America! We look forward to continuing to cover you and your loved ones in the future!